What If Everyone in the World Wanted a One-Ounce Silver Coin? I had a family member order a tube of our silver Ajax rounds last week. It was the first metal purchase they made in five years. A neighbor bought silver last month for the first time ever. And GoldSilver has seen a slew of first-time buyers this year. This all got me thinking… when crisis strikes and investors around the globe are scrambling for precious metals, will there be enough silver to go around? According to the US Census Bureau, there are currently 7.34 billion people in the world. And according to CPM Group, one of the most thorough research consultancies in the precious metals industry, there is approximately 53.15 billion ounces of above ground silver. That’s about seven ounces of silver for every earthling. Right? The amount of silver used to produce coins each year fluctuates, of course, but the point is that most silver goes to other purposes. The “bullion” portion (bars, ingots, etc.) mostly ends up in the hands of institutional investors, ETFs, etc. That metal will continue to be gobbled up in the next crisis, since it’s also an investment form of silver. Much of that metal thus won’t be available for retail customers, either (unless you’re buying bars). 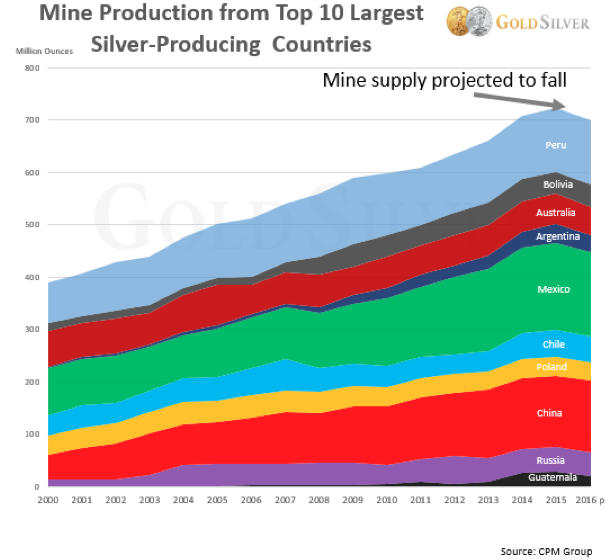 But won’t mine supply continue to grow and make plenty of silver available? No. For the first time in many years, mine output is projected to drop. That’s because many primary silver mines, and even some that produce silver as a byproduct, were forced to can development projects due to low metals prices, as well as curtail or even stop exploration efforts altogether. Worse, it will take years for this trend to reverse—it typically takes a decade from a discovery until you’re pouring metal. 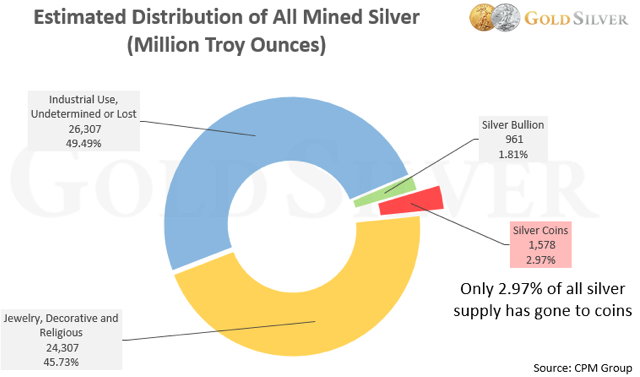 The point is, the shortfall in silver supply will not be made up by mine supply. Okay, how about scrap? Won’t there be plenty of scrap that could be melted down and made into Eagles and Maple Leafs for you and me? Nope. That trend is going in the wrong direction, too. A big part of the reason for the decline in scrap is low prices. You can see that scrap recycling spiked in 1980, which you’ll recall was when silver hit its all-time high. And that’s the critical factor about this form of supply… scrap will grow again—but only if prices are high. Here’s proof: is your grandmother rushing to sell her silver jewelry at $20 silver? Would she part with the family heirlooms at $30? Or do you think silver would have to go ballistic and hit $100 before she’d consider it? Scrap ain’t making up for the shortfall, either. So the important thing to understand about silver is that supply is already tight for investment purposes, and it’s going to get worse before it gets any better. Throw in the fact that the vast majority of people won’t sell unless and until the price is much, much higher. At some point, yes, supply will reverse its downtrend and grow again. But it won’t happen at $20 silver or anywhere near that price. Demand for investment silver just won’t let up. It’s set a new record high every year of the bear market. This includes silver Eagles. Based on year-to-date sales, it’s not hard to project that they’ll make another record high this year. 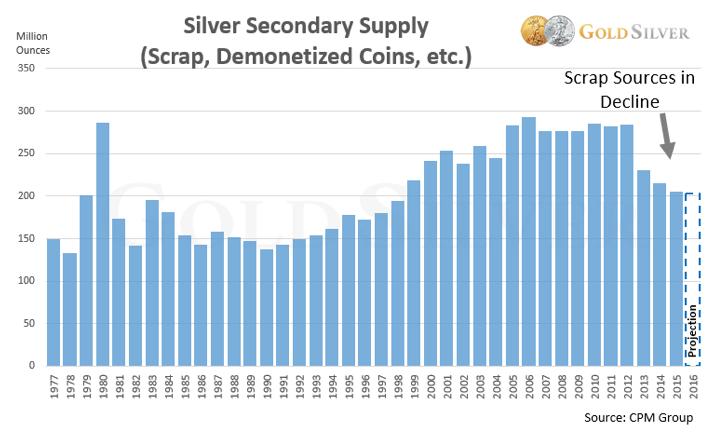 Globally, net demand for silver coins was 145.7 million ounces last year, also a record high. Consider that this unrelenting demand has occurred with most of the public still sitting on the sidelines. How many of your neighbors own gold and silver? How many of your family members, friends, co-workers, etc., have bought gold and silver? I’m willing to bet most haven’t. The point is, when the next silver rush takes hold, many people that don’t own any bullion will want to buy. And there won’t be enough to go around. Not even close. 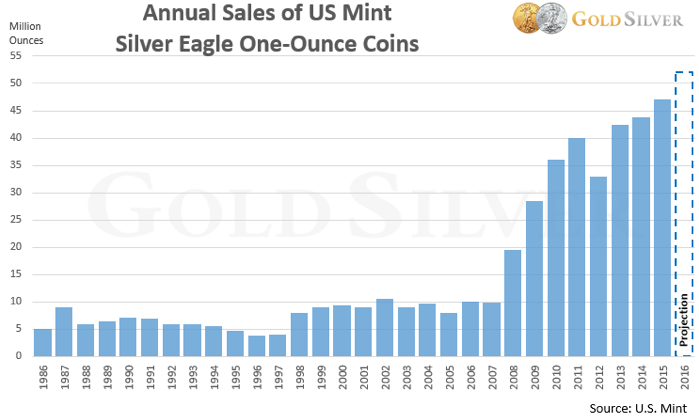 If just 10% of the US population (32.4 million) wanted to buy one tube of silver Eagles (20 coins), it would take the US Mint roughly 12.5 years to fill that demand at current production levels. To state the obvious, there’s not enough production capacity, not enough hours in the day, not enough silver, to fill that request. It cannot physically happen. The same reality applies to other countries and Mints as well. It doesn’t take a rocket scientist to see that if we hit a crisis and investors flood the silver market, there will not be enough physical metal to go around. This fact alone will drive prices higher, regardless of what else may be a catalyst at the time. It could really be a perfect storm for silver. Longer delivery times. If you’re still trying to buy physical silver in this environment, you’ll have to wait for it. And the longer you have to wait, the more that can go wrong. If you don’t know, delivery times in 2008/09 were about two months for the most popular silver items. That’ll happen again. Higher premiums. If you’re still trying to buy physical silver then, you’ll have to pay up for it. Premiums didn’t rise 10% or 20% in the last supply shortfall—they doubled and tripled. Get this… in 2008/09, premiums for some silver products hit as high as 100%! You do NOT want to be attempting to buy silver in this environment. In fact, that will be the time we’ll want to sell. And as sellers, we’ll collect some of that premium. It truly will be a wonderful and profitable time for us! Lack of metal. As Mike has said before, and I have the same belief, there will likely come a day when you simply can’t buy any silver. It just won’t be available. If there is physical metal available, funds and other institutional investors may be the only ones that can get it. If you don’t already have it, you’ll be out of luck. I urge you to buy the silver you want, now. A day is coming when worrying if you could get it 20¢ cheaper will look silly and pointless. Supply is falling. Mine production is in decline. Scrap is dropping. Demand is making new records. Nobody is selling. Most people haven’t bought yet. A monetary crisis is coming. Better get your speck of silver while you can. [By the way, I received my tube of silver Ajax coins last week and I love them! They won’t be available indefinitely—once they’re gone, they’re gone for good, so get ‘em now!